The epic adventure continues! 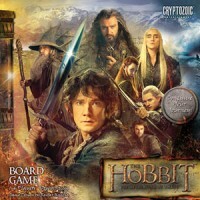 From master game designer Reiner Knizia comes The Hobbit: The Desolation of Smaug Board Game, an exciting game of adventure in which you join Bilbo Baggins™ and his 13 Dwarven companions on their journey through the Mirkwood Forest and Lake-town, to the gold-filled caverns of Lonely Mountain. Along the way The Company will encounter spiders, elves, orcs, and finally the dragon Smaug himself. Traverse your way through two boards, each more difficult than the last, with the goal of coming out alive and prepared for the dangers that lie ahead. Your accumulated points at the end of the game will be your group’s mark for finding out how good of a team you really are! This is a standalone game, but it’s also an expansion to The Hobbit™: An Unexpected Journey. New elements not found in the first game include “The Dragon’s Path” and the “Dwarven Barrel Escape.” Each will add new twists and tension to the game. Combine the two games for a wild ride and see how well your team can do! Add a Review for "The Hobbit: The Desolation of Smaug"